OK, here's a pic of our itty bitty kitties :) They are so cute! 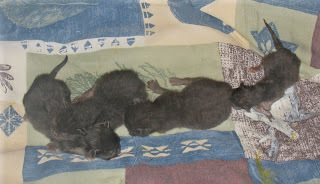 The little runt is the tiny one on the right, told you he's only half the size of the others. I've been giving him his kitty formula every few hours so I hope that will help him grow and get stronger, he's such a tiny weak little thing. awww. How cute. My whole life someone in my house has always been allergic to cats so I've never had one. I think dogs hold up to my boys better anyway. So, so cute! I'm always a sucker for the runts!